I had to install HRD on the Win7/64 PC and take a look at this for you. output, so this behavior appears to be correct. it looks like from my side. Using a cable from the notebook's speaker out to the Dongle's mic jack, and a cable from the notebook's mic jack to the dongle's speaker out, it works fine. I was just understanding Mitch as saying that you could feed the audio to/from DM780 in SOFTWARE, WITHOUT cables by selecting the Microbit 1274A in the DM780 menu. with Windows settings, hard to say. But it should work just fine. That's what I was hoping, but can't seem to get it setup. In the Microbit RRC Client, which mic/speaker settings are you using? In DM780, what "soundcard" selections are you using? I *thought* I understood windows until now.....ha ha. Well, looks like it is the LEVELS. I got into windows settings, and turn the Microbit Mic ALL THE WAY UP. Still barely is heard by DM780. Can't see any way to increase the levels. others to get digital modes working using the dongle with other programs. I tried this using a TS-480 on 14.071 for PSK. I ever decide to try digital modes again. Sorry I can't get this working. Thanks so much for trying. Ill try using short cables. Re: Micro-PC and Virtual Audio Cable use for PSK31 - SOLVED !!! I have finally found a solution for running PSK31 with HRD + DM780 on the RRC Micro. http://www.vb-cable.com has a free virtual cable (only 1 input and 1 output) that I installed and select it in RRCMicro as the mic and speaker selection. Do the same in DM780. Set the levels by HRD's AF gain control for RX and adjust mic gain, and it all works perfectly. I have worked quite a few stations today. Taking the notebook with me to Florida tomorrow, and will try it over the internet, but no reason it shouldn't work just fine. I have the same problem with DM-780 that everyone else has. I installed the virtual cables as one fellow did and DM780 works like a champ, but now I have no audio to listen to! Fine for digital modes but not so good for voice. Back to the drawing board. I'm using Windows 8. 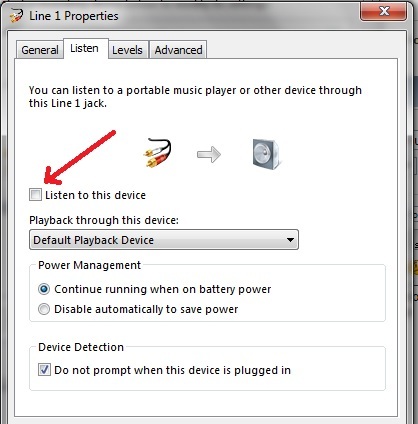 If you go into the Audio settings in Windows, under Properties, you should be able to check a box that says "Listen to this device" if you want to hear the RX audio through your speakers (I didn't want to hear it on PSK). Just realized that won't work.....when you "listen" to the Virtual Cable input, it simply re-routes it to the Virtual cable. Oh well.